The much-anticipated sci-fi drama ranks seven among all-time midnight screenings. 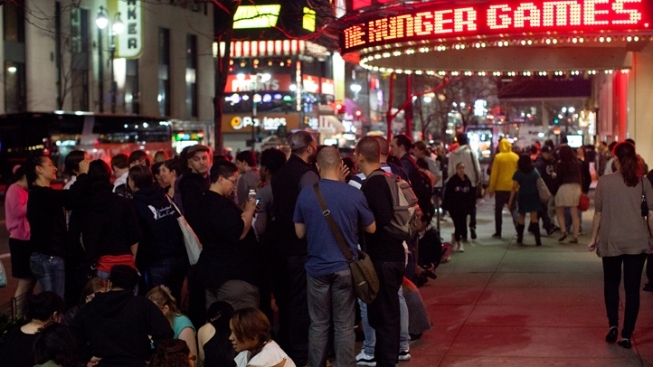 Diehard fans line up to catch a midnight showing of "The Hunger Games" in New York City. "The Hunger Games," the much-anticipated adaptation of Suzanne Collins' popular young-adult novel about a post-apocalyptic teenage death match, grossed a staggering $19.7 million during midnight screenings Friday, Reuters reported. The science-fiction drama, released by Lions Gate Entertainment, ranks seventh on the list of all-time midnight screenings, just one notch below 2009's "Harry Potter and the Half-Blood Prince." "Hunger Games," which stars relative newcomer Jennifer Lawrence (a 2010 Oscar-nominee for her breakout performance in the rural noir "Winter's Bone") also scored the highest midnight gross for a non-sequel title in modern movie history, according to The Wrap. Based on early figures, the film is on track to earn as much as $125 million over the course of its opening weekend, industry sales forecasts suggest. The fantasy flick will be the biggest hit yet for Lions Gate Entertainment, a successful independent film and TV distribution company responsible for genre favorites like the "Saw" franchise as well as the Michael Moore documentary "Fahrenheit 9/11"